Before we get into the code, we need some background information of Flux and React, which are both independent technologies. Action: Action describes user interaction that occurred in a component, such as a user clicking a button. Dispatcher: Dispatcher methods are invoked by an action component. This emits an event with data that needs to go to a store, which is a singleton registry. Store: The store listens to certain events from the dispatcher. When it listens to an event from the dispatcher, it will then modify its internal data and emit a different event for views. View: Views are typically a react component. Views get data from the store and set up a listener to refresh itself when the store emits any changed events. In React we use “JSX” to create HTML. “JSX” is optional, but it gives you more readability and is easy to maintain and debug, as well as easy for designers to change. However, browsers don’t understand “JSX,” so it’s converted into plain JS when rendered on a browser. Updating DOM is an expensive task, which is why React created an abstraction above DOM called virtual DOM. React uses virtual DOM concepts and compares Old DOM with new look of DOM stored in memory when any value changes. It also updates the changed part only in the place where the change takes place. instead of rewriting the entire DOM again, which is why React is notably faster that any other component library. We do not need to make any code changes for React to use this feature automatically. Additionally, virtual DOM allows rendering on a server where no DOM exists at all, and provides flexibility. React does not support two-way binding, unlike other component libraries, like AngulaJS and Knockout, that use two-way binding. Two-way binding is useful but it has the risk of being unpredictable. When the UI is changed in two-way binding, it triggers a corresponding model change, which will trigger another model or other UI changes. This integration becomes hard to predict for large applications and is difficult to debug. Speed: React uses virtual DOM concepts and updates only parts that have been changed by comparing the DOM to the stored memory, which makes it notably faster in comparison to other component libraries. It eliminates layout trash by using virtual DOM. Scale: It can scale to a large UI because it is very efficient in how and when to manipulate the DOM. Composable: You can easily nest a component inside of another component and pass the data to the child component via props. Pluggable: Because React is a view layer, it can be used with any technology. Isomorphic Friendly: React does not depend on the DOM to render. Instead, it avoids repeating code on both the client side and the server. 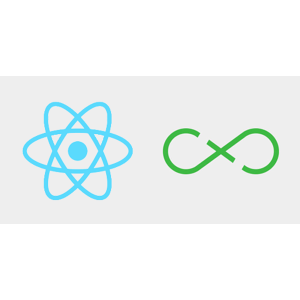 Simple: React is small and doesn’t have many moving components, so it’s easy to learn. Batten Proven: React is already being used by big companies like Facebook, Paypal, and Yahoo. Most of the technologies we are setting up here are not required to work with React and Flux, but will give you a better and easier work environment. It will also be helpful to get rapid feedback when you are building your project. Bower: This is used to manage all packages. React: This is used for component design. Flux: This is used for data flow management. Gulp: This is the task runner for development, and glues all of the above technologies together. To install NPM, we need to install “node.js” installer because NPM is a part of a node. Install Python. To do so, go to http://www.howtogeek.com/197947/how-to-install-python-on-windows/ and follow the steps listed. Open the command prompt and run the command node –v to check that the node has been installed properly. Open the command prompt and navigate to the folder where the project file is present. Run the command NPM to install -g Bower. Once the Bower installation is complete, run the command Bower install to install the decencies resolved through Bower. Run the command NPM install to download and install the dependent NPM packages. Access the URL you received from running the above command. You will be able to see the following page. To open the project, you can use any text editor with which you are familiar. We are using Sublime text. When you open the project, you will find the structure shown in below image. 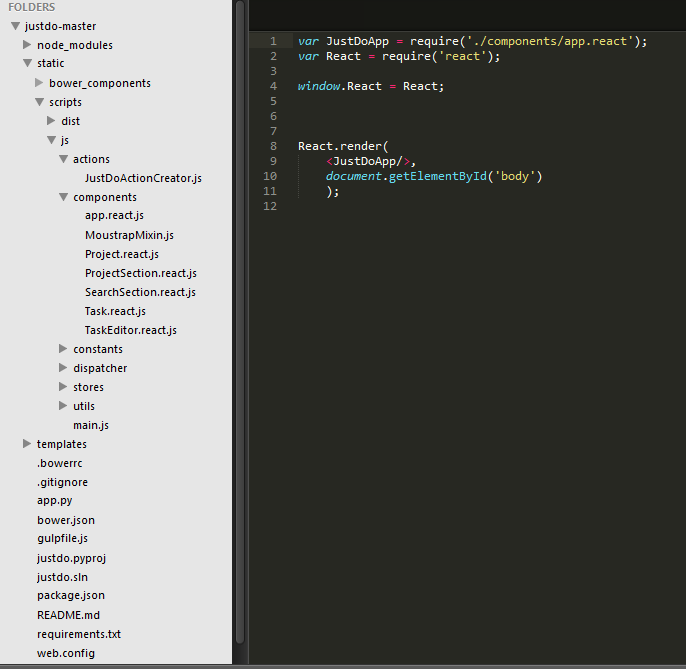 The “main.js” file inside the “Static > Scripts > JS” folder is the entry point of code. At the top of the main.js file are two “require” syntax which will use the React component. In this code, the “JustDoApp” component is rendered. This component is defined in “app.react.js” and calls on the nested “searchsection” component and the “projectsection” component. All of the React components are defined inside of the “component” folder. The “searchsection” and “projectsection” components are defined in “SearchSection.react.js” and “ProjectSection.react.js” respectively. The Dispatcher is defined in the “JustDoAppDispatcher.js” file, and requires Flux. The Store is defined in the “ProjectStore.js” file, which defines all of the data fetching points, as well as one switch case to track actions. This emits a change event when the data is updated, as well as the React component listening to this store update itself.